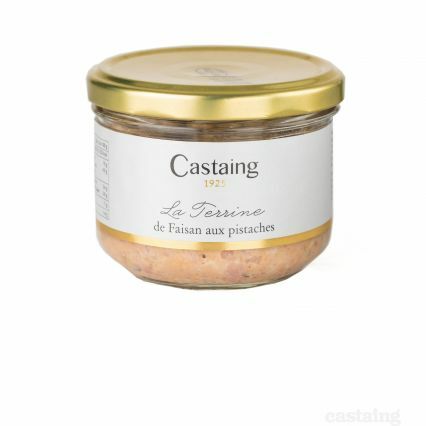 A finely and richly flavoured pheasant terrine seasoned with pistachios. Wonderful flavour and texture and a real treat enjoyed on some bread with a glass of red wine. Storage: Store in a cupboard. Once open store in a fridge and eat within 3 days. Pork meat and fat, poultry meat, pheasant (20%), eggs, pistachio (3%), porto wine, armagnac, starch, gelatine, shallots, salt, spices, sugar, aromatic plants, preservative (sodium nitrite).